Next year, Werner Herzog will bring Death Row, four hour-long documentaries spotlighting death row inmates, to television. The case of Michael Perry, who along with a partner murdered three people in Conroe, Texas in a scheme to steal a red Camaro, was to have been part of the series. But the more Herzog delved into it, the more dimensions Perry’s story took on until the filmmaker realized it was a larger tale than the miniseries could contain. His latest feature documentary, Into the Abyss, was born. “It was so mind-boggling, because of the senselessness of the crime and all of the ramifications and repercussions of it that I thought, ‘This is epic, this is a big movie,” says Herzog during a recent visit to San Francisco. Herzog’s second documentary this year, Into the Abyss sets up quite a contrast with the first, Cave of Forgotten Dreams, a tour of cave paintings – the earliest human artwork yet discovered – in France’s Chauvet Cave. But while on the surface one film shows the worst of humanity and the other the best, Herzog observes a thematic link between the two. Herzog is opposed to the death penalty under any circumstance, yet Into the Abyss is no screed. He simply lets the people involved tell their own stories. Among these are Perry, who the director interviewed only once, eight days before his 2010 execution; Perry’s partner Jason Burkett, who is serving a life term; Burkett’s father, Jared, himself a lifer; the daughter and sister of two of the victims; the brother of another; a prison chaplain; and a former head of the “tie-down team,” essentially an executioner. It is a bleak, ugly tale of wasted lives and heartbroken families. Yet within it, Herzog also found something to celebrate. “In Into the Abyss, you see some of the best of the best,” he insists. “When you look at the former captain of the tie-down team, for me, he’s like a national treasure. His weight should be measured in gold. In early antiquity, you would weigh a good man in gold and he’s one of those. I really like to find these kind people in the heartland of America. I love most of America. I’m not really into Texas bashing – when you look at a man like that, yes, he’s a Texan. 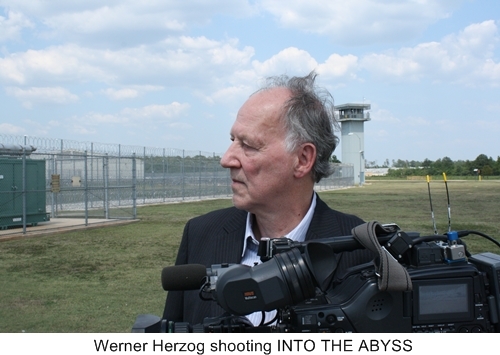 Herzog insists that the film is not meant as a commentary on the criminal justice system. The murders occurred in 2001. What happened at Perry’s arrest, his trial, and appeals does not concern him. Instead, the story touched him on a more personal level. He points out that the full title of the film as it unreels in the opening credits is actually Into the Abyss: A Tale of Death, A Tale of Life.